EASIEST TO USE: The Lowrance HOOK2 5 Fish Finder features auto-tuning sonar and phone-like menus giving you more time to spend fishing and less time dealing with settings. WIDER SONAR COVERAGE: The HOOK2 5 offers a wide-angle CHIRP sonar cone giving you double the coverage of traditional fish finders. EASY SETUP: A single transducer can be mounted on the transom, inside the hull, on the trolling motor or through a scupper hole. The HOOK2 5 is ideal for small fishing boats or kayaks with limited console space. 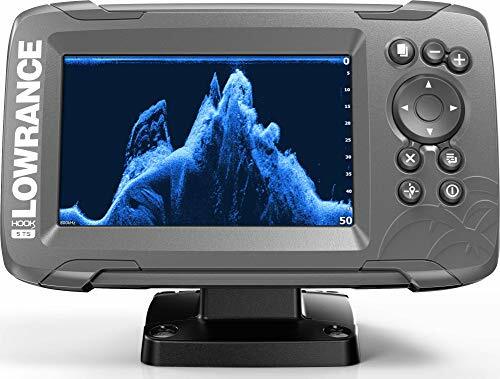 MORE SONAR VIEWS: The Lowrance HOOK2 5 comes complete with a TripleShot transducer which gives you DownScan sonar (straight down), SideScan sonar (up to 300' to each side), and CHIRP sonar (fish arch) views. FISH FINDER & GPS: The HOOK2 5 provides basic navigation with a GPS plotter that allows you to add waypoints, follow trails, and navigate. Store: open_box_sports Condition: Brand New Price: $543.16 Total Price: $543.16 Buy It from open_box_sports No returns. Store: WhyNotOutside Condition: Brand New Price: $516.41 Total Price: $516.41 Buy It from WhyNotOutside Want it delivered by Friday, May 3? Lowrance HOOK2-5 Tripleshot US Inland Lowrance 000-14285-001 -- Free Overnight Shipping! Get Your Stuff Tomorrow! Last updated: April 20, 2019 at 11:44 EST. Pricing information is provided by the listed merchants. GoSale.com is not responsible for the accuracy of pricing information, product information or the images provided. Product prices and availability is subject to change. Any price and availability information displayed on amazon.com or other merchants at the time of purchase will apply to the purchase of the product. As always, be sure to visit the merchant's site to review and verify product information, price, and shipping costs. GoSale.com is not responsible for the content and opinions contained in customer submitted reviews.